What does it mean to be pretty? Do you really need someone to validate your appearance? Neil LaBute tackles our obsession with physical beauty head-on in a work nominated for multiple Tony and Drama Desk Awards. Our production, directed by the playwright, includes original Broadway cast member Thomas Sadoski, whose acclaimed performance also earned a Tony nomination. Includes a backstage conversation with Neil LaBute and the cast. 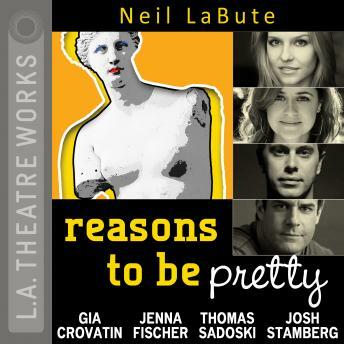 An L.A. Theatre Works full-cast production featuring Jenna Fischer, Thomas Sadoski, Gia Crovatin, and Josh Stamberg. Written and directed by Neil LaBute. Recorded by L.A. Theatre Works before a live audience.